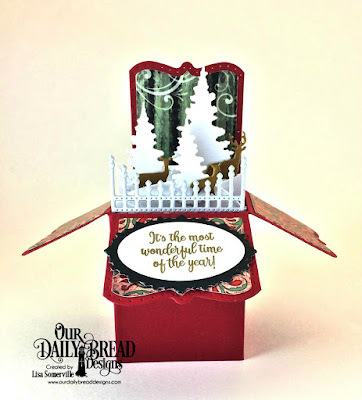 Welcome to the ODBD November New Release post and Blog Hop showcasing projects from Our Daily Bread Designs November Release! You can see all of the fun November Releases here. Continue reading below to find out how you can win one of three $25 Gift Codes to the ODBD Website. Today I'm sharing three projects with you using products from the November Release along with additional ODBD Custom die sets, please see my supply below each projects. My first project uses the Surprise Box die set. I created a scene using the following die sets: Trees & Deer, Curvy Slopes and Gilded Gate. The beautiful papers are from the Christmas 2017 Collection. 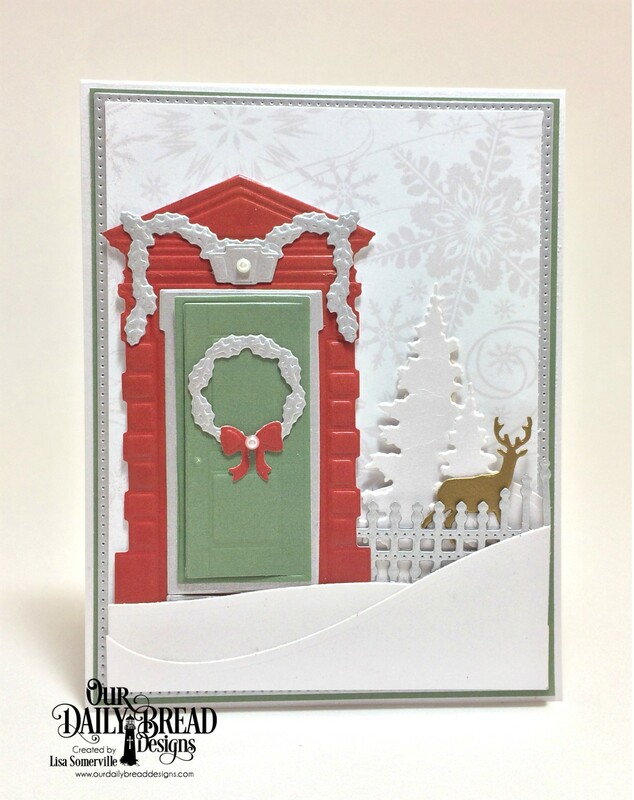 I used a lot of the same die sets that I used in the Surprise Box to create the scene on the card below, this time I also added in the new Welcoming Door and Christmas Door Greenery die sets. The door opens so that you could add a sentiment or verse to the inside of the door. 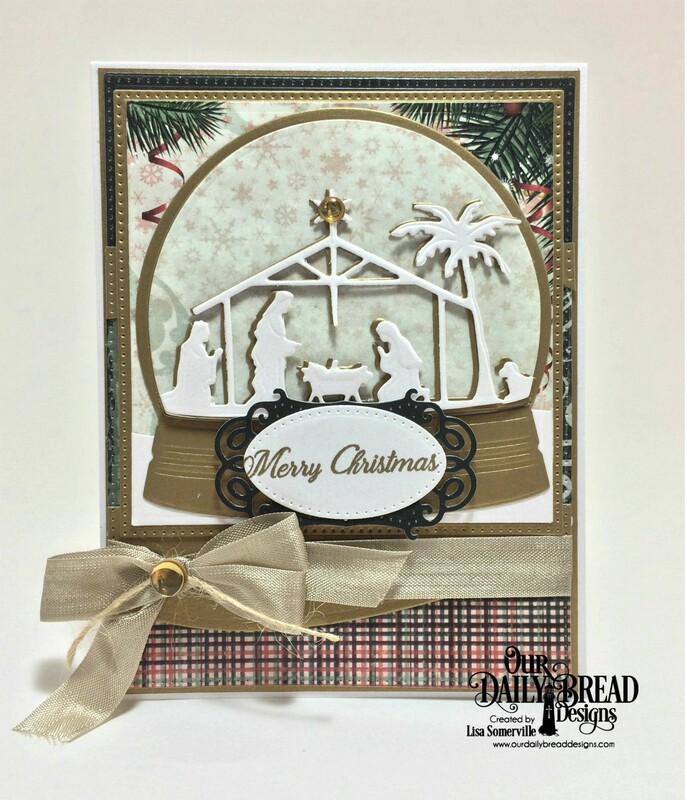 There are so many different stamps you can use along with the new Snow Globe die set, for my card, I decided to used the Holy Night die. Three randomly selected winners will each receive a $25 gift code to the ODBD Website just for commenting on the Design Team cards! You have until November 2, 2017 at 9:00 p.m. EDT to leave your comments. The Winners will be posted November 3rd, on Our Daily Bread Designs Blog, so be sure to check back there to see if you won! Oh my, these are all so fantastic. I have that box, wow, love what you did with it. So many great dies to go with the snow globe. Thanks for the inspiration. Beautiful cards! 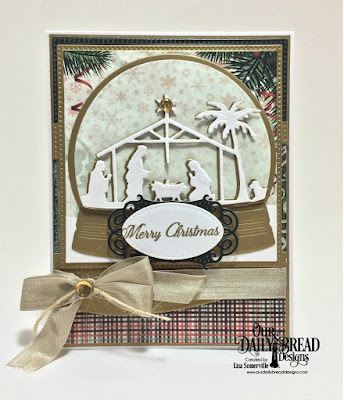 Love the nativity scene and that pop-up box card is awesome! Thanks for these inspiring cards. All lovely cards! The nativity snow globe is my favorite. Thanks for sharing! Love the nativity and snow globe together. Beautiful card. Very beautiful love all the cards nice box card. Thanks for sharing have a blessed day. Wonderful cards. I really like the nativity snow globe. I love them. Thanks for the inspiration. Beautiful, Lisa! Great idea with the surprise box! love the first two winter scenes and the nativity inside the shaker is just perfect! Your projects are beautiful! Great job! All of your creations are so pretty! I couldn't possibly pick one over the other as I adore them all that much! Beautiful projects. I love them all. All your projects are beautiful Lisa!! Such gorgeous scenes!! Love your use of all the dies. Beautiful cards!! The die cuts are lovely! The box card is lovely! I love the Holy night die. beautiful! love the snow globe card!! I enjoy making box cards and your idea of putting the fence around is so neat. I also liked your idea of using the nativity die inside the snow globe. What gorgeous cards! Love the nativity scene and the trees and dear. Love these fantastic cards, Lisa! So much creativity in one post!!! Adorable! !